What does the Clinical College of Colorado offer? 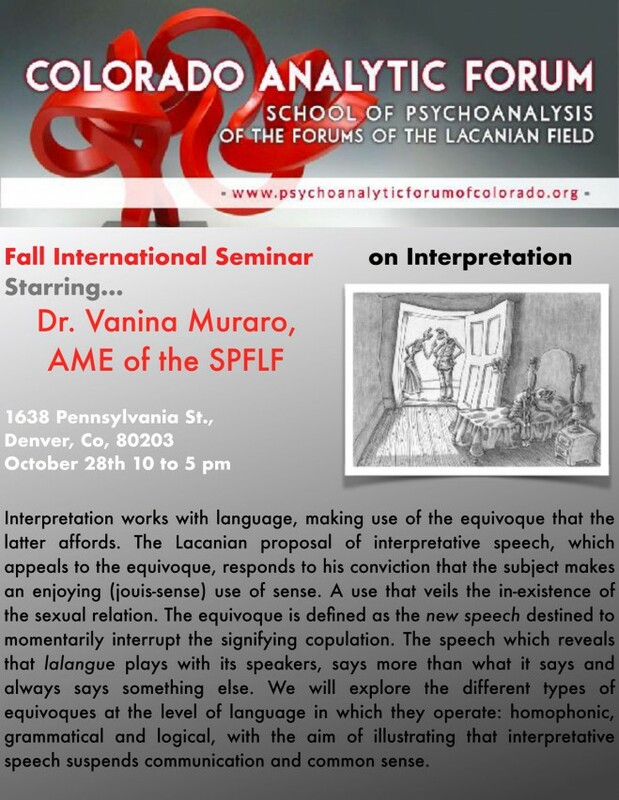 In our seminars and workshops we offer a Lacanian psychoanalytic formation of a sustained approach to the cardinal texts with a clinical emphasis. While we endeavour ourselves in the task of transmitting a reading operation, the main focus of our transmission aims to convey the logic at stake in the analytic experience. Our faculty is international and plurilingual (Spanish/English/French). All of our seminars will have the possibility of online attendance. Which are the ethics and politics that guide our teaching? 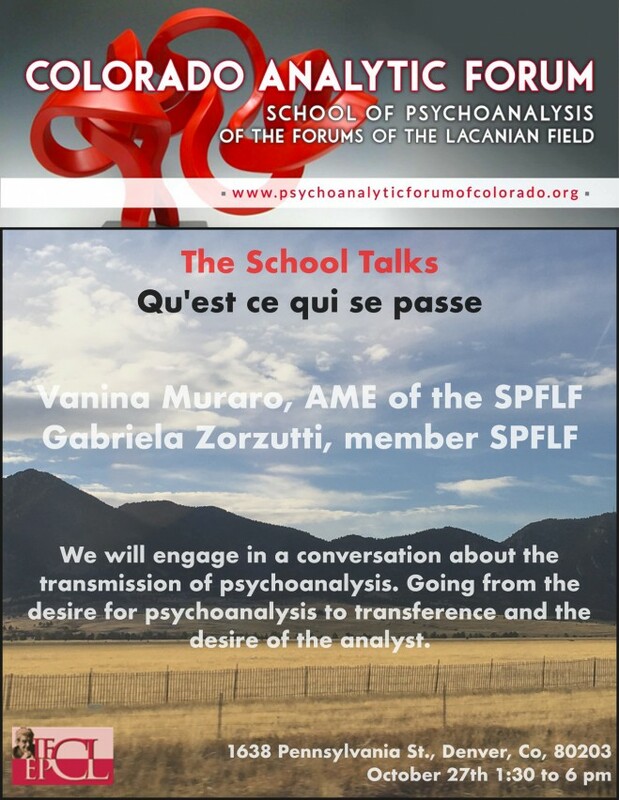 Our teaching is integrated in the network of the International of the Forums and in the School of Psychoanalysis of the Lacanian Field. 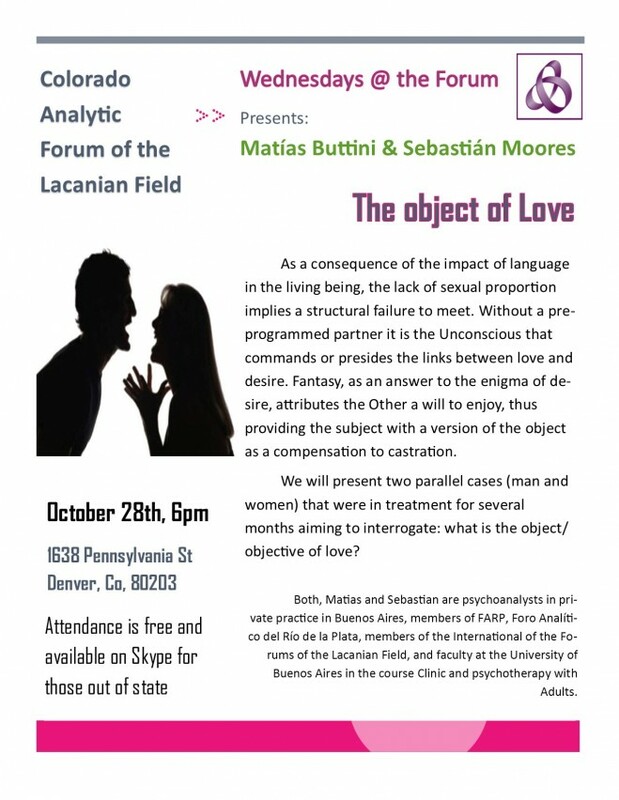 The teaching is guided by the principles that Lacan derived at the time of his Proposition. 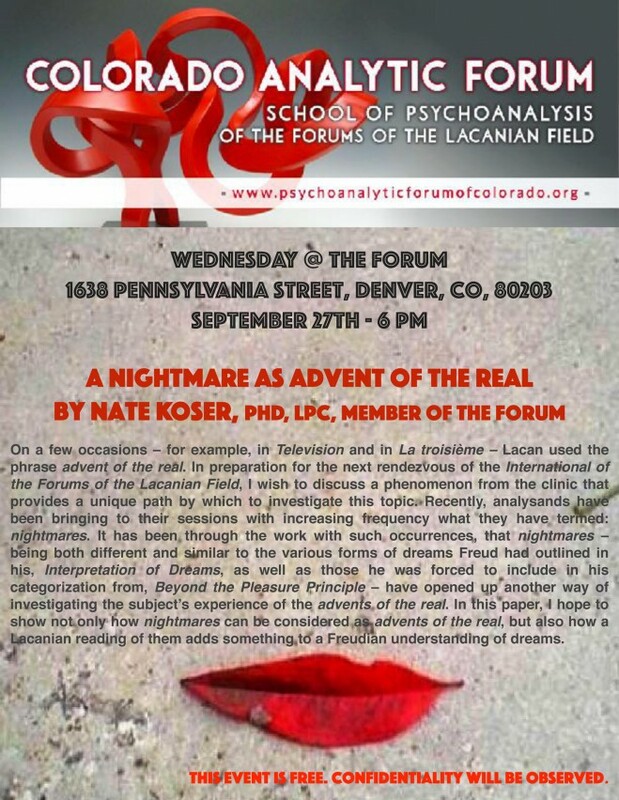 We dedicate annually two International Seminars, where we host a guest analyst who comes to work with us for a weekend, and a monthly space of discussion aiming to capture the reach of the imbrications of the different instances that conform our analytic community: our School of Psychoanalysis of the Forums of the Lacanian Field (international), the Colorado Psychoanalytic Forum and now the Clinical College of Colorado. What is the aim of our teaching? We aim to transmit the logic of the unconscious. To create a place where desire can be fostered, by way of establishing strong working transferences among us. We believe this is possible when discussions are welcomed, where differences can be present in a non threatening manner, in a way that propels the work… the work of thinking that is. We aim to propitiate an environment to bond with colleagues, giving privilege to the dialog with all those who are embarked in the difficult task of practicing analysis as well as colleagues from academic areas who are attracted to the analytic discourse. We propose to work on our uncertainties with others, to engage in discussion, to find referents and peers with whom we can share the clinic. In short, we aim to question ourselves time and time again about that original experience of the unconscious that we traversed as analyzands and as analysts at last. What is the duration of the Clinical Formation? 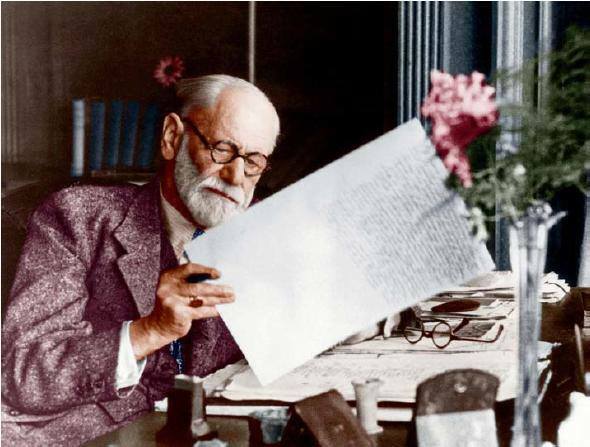 In principle it is an itinerary of three years, which is not exhausted in the sole study, but rather it is about an experience that will underline the problems elicited by psychoanalytic practice. Experience that is traversed according to the rhythms of each one at the time of daring to sustain this praxis ethically, that ternary practice inaugurated by Freud which is nurtured by one’s own analysis, control analysis (supervision), and the conceptual endeavor. We understand that even if the Clinical College has a beginning and an end, it implies above all an entry. Those who decide to enter, will have from the beginning the encouragement and the support to participate in all activities of the Forum, including the opportunity to get group supervision if they decide to be part of the referral system of our Forum. 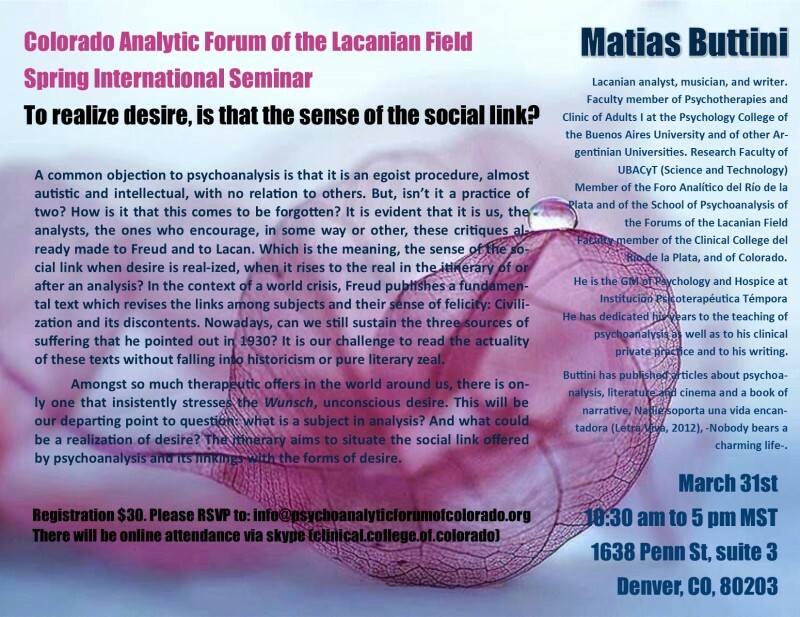 The International Seminar is a hinge space that has an articulating function between the three instances of our institution, which are: the Clinical College of Colorado, the Colorado Analytic Forum of the Lacanian Field and the School of Psychoanalysis of the Forums of the Lacanian Field. The aim is to foster a good working and discussion climate that will continue to cause us in this endeavor, allowing us to bring to bear the desire of the analyst and its effects, while enjoying the clinical appreciation of colleagues from other cultures, where the clinical manifestations change; to propitiate links with our peers around the world and learn from each other. We will host an International Seminar twice a year, in the Fall and in the Spring. 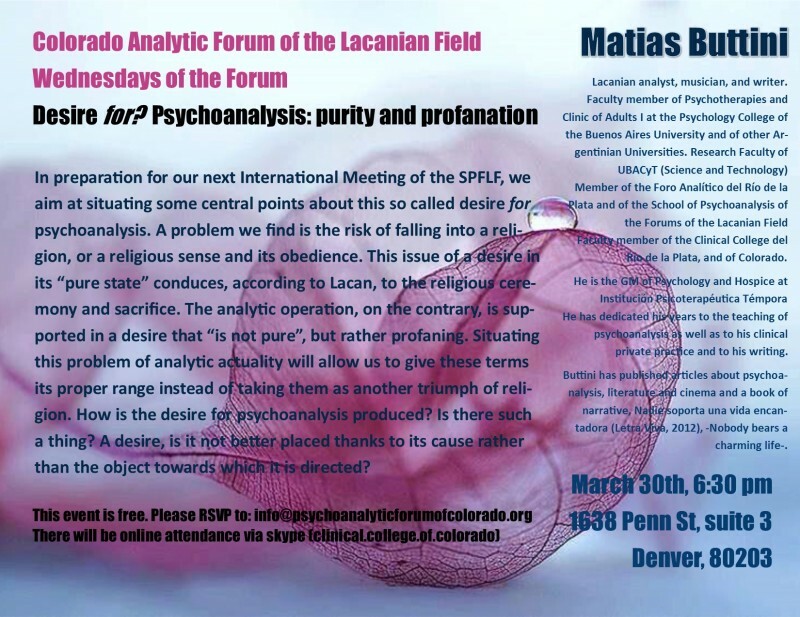 In each opportunity we will welcome an analyst from the world wide community of the Lacanian Field. 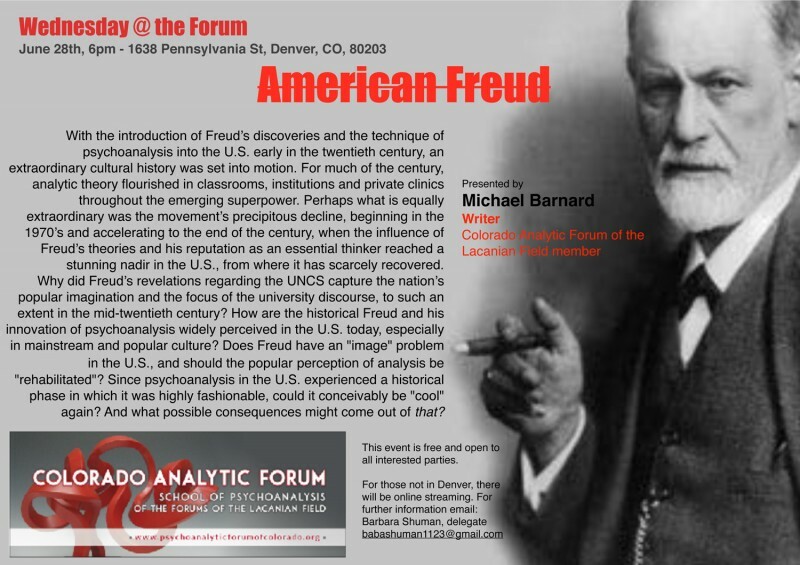 Attendance to the International Seminars is free for full time students of the Clinical College of Colorado.